We are excited to introduce our artist for May/June 2012, Anna Daeuble. The Horseshoe gals were so inspired by Anna's work, we created a color palette that echoes the hues in one of her gorgeous mini series! 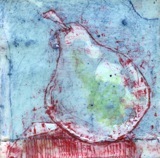 Anna works in wax, oil pastel, powdered pigments and graphite dust. She work in a small scale and concentrates on simple lines and gestural forms. You might find her roaming her neighborhood to pick up twigs and berries, buds and fallen leaves which she will then take home to her kitchen table-come-encaustic studio. Anna has been showing her work in local shops and galleries since 1998. I was born in Northern New Mexico, in a farming community on the Rio Grande. We moved to Seattle when I was 7. I have stayed in Seattle for most of my life, besides my college years, where I spent in Eugene Oregon. The color of wet pavement and dead weeds. What do you usually wear when you are working on your art? It depends on the medium, but lately an apron or smock over my PJ's. What is the last album you listened to when you were making art? (or what do you listen to when you work?). The playlist I have been working by lately includes albums by Josh Ritter, Gillian Welch, Matthew Mayfield, and then the cherry on top, Salt-n-Peppa's single Whatta-Man. Stormy days or Sunshine, what's your preference? I like right between; after a rain when the sun is coming out, when the pavement color is the prettiest. I like right before a storm too, when you can smell the rain coming. This changes a lot, but right now I like pea green and raspberry. Do you have a website or any other information where people can find out more about you and your art? annariverdesigns.com, though the site is in desperate need of an update.